For safety and ease of operation, Kasco includes a control box with all decorative aerator models and offers the control boxes as an option for the high oxygen transfer models. Both control boxes include a 24-hour timer, ground fault protection, and a receptacle for ease of power connection. Model C-25: Kasco's C-25 GFCI Control Box is a standard component included in the 1400JF, 2400VFX, 3400VFX, 3400JF, and 4400VFX Floating Aerating Fountain packages and is optional with any 120V Pond Aerator or Water Circulator. The C-25 is a plug-and-go model control box that is customer installable for quick and easy set-up, no hard wiring is necessary. The C-25 features a 24-hour timer, GFCI protection, and a photoelectric controlled outlet for the LR-275 or LR-375 Lighting Packages, as well as the LED Light Ring lighting package for the 1400JF. The GFCI, 15 amp circuit is designed to protect you and your equipment. 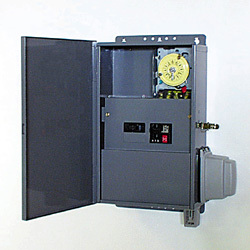 Model C-75: The model C-75 120V/240V Unit Control features GFCB protection, a 24-hour timer, a lightning arrestor, and a light-ready low-voltage transformer in a rain-proof enclosure. A photoelectric, unit-synchronized circuit controls the low-voltage transformer for the L-375 or L-350 lighting package. The C-75 comes standard with the F3400H/VF and 8400/JF Decorative Aerators and is an option for the F3400H/AF and 8400/AF High Oxygen Transfer Aerators. This control box requires hard-wire connection to four leads (two hots, a neutral, and a ground) and must be installed by a qualified electrician. ML200RTW: The ML200RTW is a low-voltage, ground-shielded transformer for use with Kasco's submersible lighting packages. The ML200RTW powers systems up to 200 watts and includes a multiple ON/OFF timer. 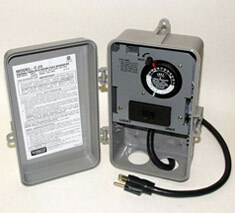 This transformer is included with the L-350T Lighting Package. A remote photoelectric eye is available as an option.